Heat a large, non-stick frying pan over a high heat. Season the steaks and fry in batches, if necessary, for 3-4 minutes on each side, or until cooked to your liking. Set aside in a warm place to rest. Return the frying pan to a medium heat. Make the pepper sauce by whizzing the tomato, almonds and peppers in a blender until smooth. Add to the pan and cook, stirring occasionally, until just simmering. Keep hot over a low heat. 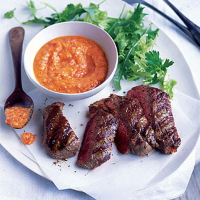 Thickly slice the steaks, stirring any of the steak resting juices into the sauce, and serve on 4 plates with a little of the pepper sauce and a handful of the herb salad.